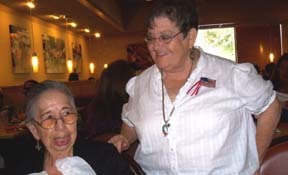 This Thursday August 23, 2012 from 1 to 3pm, the TONKAWA Elders club met early and on time at the University Avenue Home Town Buffet. This was again the site for this hosted TONKAWA Summer luncheon gathering. We hope you enjoy the images of this delightful afternoon. Much as our regular TONKAWA monthly meetings each second Sunday of the month, at the IHRC Fairmont Ave. SD, CA, the members come in smiling and are ready for good talk and good food. Conversation that is what makes for the best spice when lifelong friends meet for a meal. Club officers: Jean Vigeneault and Roy Cook greeted Nellie Ruiz. 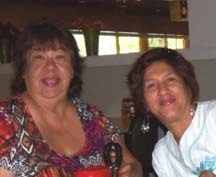 They were delighted to tease, joke and greet Vicky Gambala and Antoinette, Manuel and Cecelia Flores, Ben Nance, Verna Antonio, Mary Oyos and her relations. These, along with Gwendalle Cooper and Barbra Shramek and many other beautiful people whom I may have missed or forgotten your name. I am using that line, senior moment, more and more each day! Our invitation and intention was limited but successful for all attending to be the welcome guests at the TONKAWA annual luncheon table. We appreciate and applaud Vickie Gambala for volunteering to assume the office of TONKAWA President. I thank you all today for the hugs and good wishes of the Summer Pow wow season. Most of the TONKAWA members will be attending the Sycuan annual pow wow in September- no meeting. Therefore, we hope to see you all at the next TONKAWA meeting at the IHRC Fairmont Ave. SD, CA, on October 14, 2012. We sincerely wish you all the possible happiness and better health the remaining of the year.